Submitted photo Dr. Gerald Troy, a retired Xenia optometrist, recently participated in a ceremony celebrating the 50th anniversary of his graduation from The Ohio State University College of Optometry in June 1968. Troy practiced optometry in Xenia from 1968 to 2005. Troy has received several honors including the Xenia Daily Gazette People’s Choice Award for “Best Optometric Care in Greene County” in 1997. Pictured with Troy is Dean Dr. Karla Zadnik. 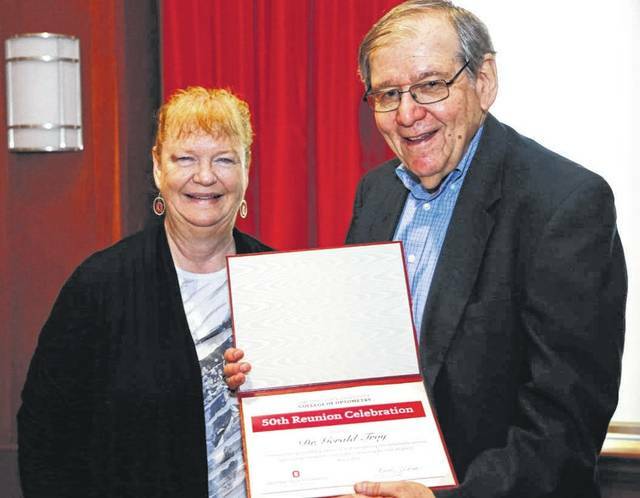 Dr. Gerald Troy, a retired Xenia optometrist, recently participated in a ceremony celebrating the 50th anniversary of his graduation from The Ohio State University College of Optometry in June 1968. Troy practiced optometry in Xenia from 1968 to 2005. Troy has received several honors including the Xenia Daily Gazette People’s Choice Award for “Best Optometric Care in Greene County” in 1997. Pictured with Troy is Dean Dr. Karla Zadnik. https://www.xeniagazette.com/wp-content/uploads/sites/32/2018/07/web1_IMG_0898.jpgSubmitted photo Dr. Gerald Troy, a retired Xenia optometrist, recently participated in a ceremony celebrating the 50th anniversary of his graduation from The Ohio State University College of Optometry in June 1968. Troy practiced optometry in Xenia from 1968 to 2005. Troy has received several honors including the Xenia Daily Gazette People’s Choice Award for “Best Optometric Care in Greene County” in 1997. Pictured with Troy is Dean Dr. Karla Zadnik.